Remember when everyone covered Tea Party rallies? When they showed the classic spirit of America rising up to stand for something? Except, what did they stand for again? Originally they seemed to say "we stand for really, really low taxes," but they then also stood for solving the deficit. Because apparently it's possible to solve the deficit problem ENTIRELY by cutting spending. Most people with a brain know, that short of flat out ending Medicare and Social Security, that's impossible. I could go on and on about the lack of logic here. Or I could just say, hey that's the Tea Party. We want it and have no idea how to actually do it, except to say Barrack Obama, bad. What I love even more is how the Tea Party protests became more conservative over time. Eventually they got angry about abortions and gay marriage, until they were simply having a protest that said, "we're conservative, and we lost the last election and we're angry." Great stand guys. Way to honor this country's history of protest. We only have the tradition of ending the Vietnam War and restoring Civil Rights via protest. No biggie. And certain media, *cough* Fox news *cough* noticed these rather lame events and said the people are speaking, it should be the top story, And yet today, when 15,000 unionized workers of Wisconsin (unions were basically the originators of the US protest, they tend to do it well) gathered to fight against laws designed to "fix the budget" by taking away union rights to collective bargaining. I went to the Fox News website. They were more interested in governors "snubbing" Obama, and Scott Brown's upcoming biography. Now of course I must admit my own bias in this matter. My sister has recently begun working for the ATU, the Amalgamated Transit Union, and she was in Wisconsin for this protest. (She's the only she in the picture) But the fact remains this is a huge deal. In this country Republicans have been allowed to demonize unions and blame them for budget problems. Are we really supposed to think that public employees are making too much money? That the city bus drivers or the garbage men, are living lives of luxury? These are people taking unwanted and necessary jobs. Without unions, today they wouldn't have a minimum wage to give them chance of a decent life. Government employees who unionize aren't corrupt bureaucrats. They are people who do real jobs just like anyone else and deserve real pay. 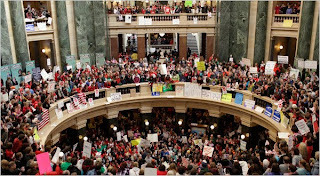 If this plan to eliminate collective bargaining passes in Wisconsin, other governors may follow suit. If so our country will truly have fallen backwards. Income inequality in this country has been rising. The gap between the top 1% and everyone else is as high as its been since just before the Great depression. The first time America faced this problem and closed this gap, it was through the growing union movement. Without the proliferation of unions, our country wouldn't have formed the American dream. It was through unions that someone could pick himself up by his bootstraps and make it. Unions are an important staple of our history. We can't afford to go back to a time when workers had no say in how things were done. We've simply come too far to allow some overzealous governor to set our country back 100 years. So let's support those 15,000 workers in Wisconsin who are standing strong for all of us. 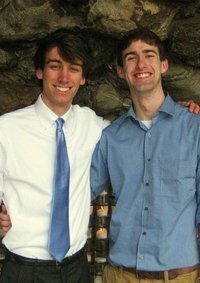 Editors and active writers from Lefty’s have surveyed this year’s contenders for Student Body President and VP and are proud to enthusiastically endorse Pat McCormick and Brett Rocheleau in today's Student Government elections. "The Scholastic staff is endorsing the McCormick-Rocheleau ticket...Their platform offers a vision for a student government that can do more than address the everyday problems and gripes of students. While hot dog prices and Fro-Yo flavors are important, McCormick and Rocheleau realize that given the power of student government, they have a responsibility to affect change both on and off campus in the spirit of Rev. Theodore Hesburgh, C.C.C. 's vision for the university...the hopeful spirit of McCormick and Rocheleau...is infectious." "The ticket of Pat McCormick, chair of the Social Concerns Committee in Student Senate, and Brett Rocheleau, sophomore class president, presents a compelling platform of uniting student government with larger social justice causes." (1) Set a university goal of reducing our carbon footprint from 2005 levels by 70% by 2050. There are several major areas where the University can work to achieve the reductions necessary to accomplish this goal. They include increasing University investments in energy conservation initiatives and the Green Loan fund, utilizing less carbon-intensive fuels, conversion to LED light standard, consolidating campus data centers, achieving the installation of real-time metering, mandating purchases of Energy Star appliances, and expanding education and outreach efforts on campus. Students at Notre Dame have long advocated for this commitment, and its time has come. (2) Expand inclusion in the Notre Dame family. In his address to students at the opening Mass of the 2010-2011 academic year, Provost Burish spoke of the uniqueness of the Notre Dame family. He is right, and we must do everything we can to continue to expand the circle of our Notre Dame family to extend ever further in order to answer the cry from Scripture: “Am I my brother’s keeper?” (Genesis 4: 9). There are many groups on campus leading a campus-wide response to this call, and several opportunities worthy of Notre Dame’s consideration include providing greater resources for GLBTQ students by granting club status to a gay-straight student support group on campus, expanding opportunities for workers to share their concerns regarding conditions, living wages, and placing the dignity of work at the center of university employment policy, working to improve access to quality education in the community, affirming the centrality of Catholic social teaching to the mission of the University, and partnering with external organizations to preserve and protect human dignity both at home and abroad, especially given the existence of a Memorandum of Understanding between the University of Notre Dame and Catholic Relief Services. (3) Make Notre Dame the premier forum for nationally-recognized events uniting athletes, entertainers, and policy-makers on behalf of social justice. The guiding vision for our campaign is the role that students can play in leading Notre Dame to become an ever more powerful “lighthouse and crossroads” for the world. Fr. Hesburgh first offered this image as a vision for the university, and we have chosen it as the symbol of the hope a new generation of students has to write a new chapter in our school’s history. The University of Notre Dame -- our campus, the Joyce Center, Notre Dame Stadium – should be the premiere venues for nationally-recognized events that unite our country’s leaders – in athletics, the arts, and government – behind important social justice goals. Recently, Hope for Haiti Now united actors like George Clooney and Julia Roberts, entertainers like Shakira, Alicia Keys, and Taylor Swift, and the people of America in a concert aimed at bringing aid to earthquake victims. In past years, LiveAid, FarmAid, and We Are The World brought Hollywood, professional sports, and our nation’s political leaders together behind great social justice needs. Each of these events had to find a forum: why not Notre Dame? We are off to a good start. Playing for Peace is a model of the type of change we want to bring to student government. Already Playing for Peace has attracted national attention – attention that has gone all the way to the White House, and includes Kalpen Modi – who formerly played Dr. Kutner on House and Kumar in Harold and Kumar, and now advises President Obama on matters involving social justice and public engagement. Hello, fellow Dems. I haven't been around Lefty's in awhile, but that doesn't mean I'm any less committed to progressive causes. In fact, I've been pretty busy planning the Kennedy Obama Dinner, hosted by the College Democrats of Indiana. This year, the dinner is coming to the College Football Hall of Fame in South Bend, Indiana on March 5, 2011. We are currently organizing our speaker list, which will definitely include short statements from Democratic South Bend mayoral candidates and a keynote address from Sam Locke, an Indiana native and one of the most prominent young Democrats in the state. I think it is also worth mentioning that the Hall of Fame will be fully accessible, so you can explore and socialize before the sit-down dinner while reading up on some college football legends. We have a wonderful menu planned, and if last year's dinner is any indication, the evening will be a ton of fun. We are charging $15 for students (sorry its not free, but come on, its a fundraiser), and $50 per plate for non-students. I cannot wait to see all of you there, and I know you will do your best to spread the word so College Democrats of Indiana can function better than ever in the next year. Please contact me at alyssa.j.sullivan@gmail.com to register or if you have questions.